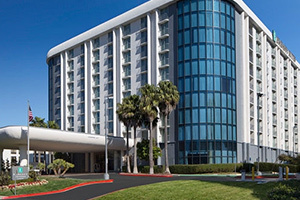 The modern Embassy Suites by Hilton San Francisco Airport hotel is conveniently located minutes from the airport. Enjoy spacious accommodations in this all-suite hotel where a separate living area and bedroom are standard features. The flexible rooms have tiered WiFi available and convenient, delicious dining options at your fingertips. Hotel is located 4 miles from San Francisco International Airport and 10 miles from downtown San Francisco.